Red cow dairy is a leading dairy firm offering quality and mouth-watering canned Rasgulla in India. Mr. Narayan Majumdar, a dairy technologist and the owner of Red Cow Dairy got perturbed by the outcome of urbanization and increasing pollution which led to the crisis of supply of milk, hence started his business. Fifteen years since the business have been very smooth and fast growing. In Eastern India Red Cow Dairy is one of the largest private sector dairy. Are you a foodie?? Are you a desert lover?? Are you an Indian; More specifically a Bengali?? Then you might think alike of the many who in one chance would take the name of Rasgulla if asked about their favorite desert. It is basically of Indian origin - a delicacy of Bengalis who serve rasgulla as their prime sweet dish. It is said that ‘Good news is even sweeter if bought a packed of rasgullas along.’ Rasgullas have descended from the era of Zamindars and Babus to the technological world of tabs and i-phones. But the delicacy and taste remains the same. It is a dairy products which is directly made from the torn milk and straining it through various heating and cooling processes. For making spongy and slurpy rasgullas we need three main ingredients. Red Cow Milk which is fresh and excessive fat free, 1-3tbps of lemon juice, 2tbps of semolina, 2 cups of sugar and a litre of water. The recipe is way too simple. At first you have to boil the milk with repeated stirrings and then add the lemon juice and put the gas to the lowest button. Wait till the milk gets curdled. Sieve the torn milk through a muslin cloth and hang it for 30 minutes to let the excess whey to pour out. Once it is enough dried and the excess water has drained out, take the chhena from the muslin cloth and add the semolina and start kneading. After kneading for 10 minutes with light palm pressure make small balls and keep it aside to rest. In another pan make the syrup by pouring the sugar into the hot water and let it come to a boil. Add the chhena balls to the syrup, and let it boil for some time. The slurpy rasgulla is ready to be served hot. 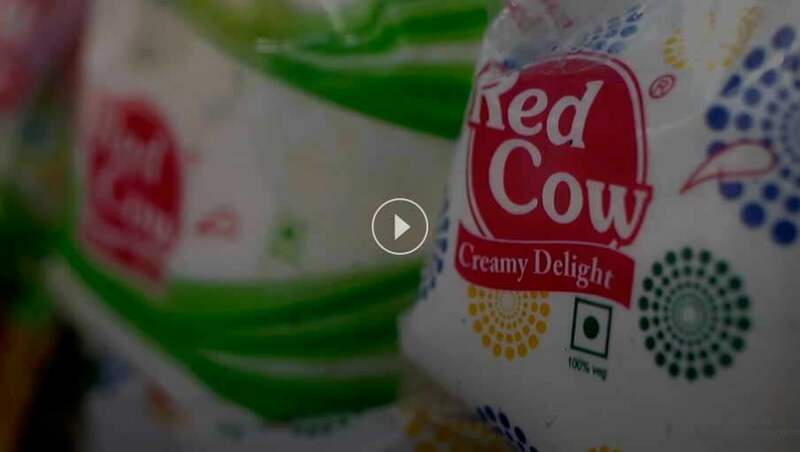 Why You Chose Red Cow Dairy for Canned Rasgulla? Quality is maintained with the brand name. Well skilled professionals are working under us. The can which is used is free from microbes. Red cow dairy produces milk in a large scale, that milk is used to produce the chhena balls, the syrup is light and moderately sweet. Cost-effective and can be preserved for many days. Red Cow Dairy, in short serves the best canned rasgulla & Canned Sweets in the most hygienic cans with utmost care in taste. For more information, product details and others you may call us at 03212-237004.